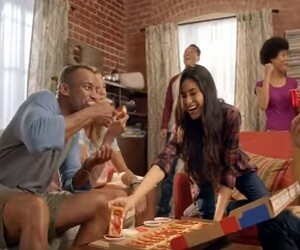 Pizza Hut has released a new commercial to advertise the Big Flavor Dipper. The 30-second spot (as there is also the 15-second version) features a group of friends and families getting ready to have pizza in their living room. “While the best athletes gather to compete, the rest of us gather to eat”, says the voiceover, adding that “Pizza Hut Big Flavor Dipper is here”. According to the ad, there are almost two feet of pizza, with four Flavor Dipper sausages: Texas Honey Barbecue, Original Marinara, California Ranch, and New York Buffalo. “Big enough to feed the whole team, for a small price: just $12,99. The Big Flavor Dipper Pizza. Only at Pizza Hut” says the voiceover at the end.